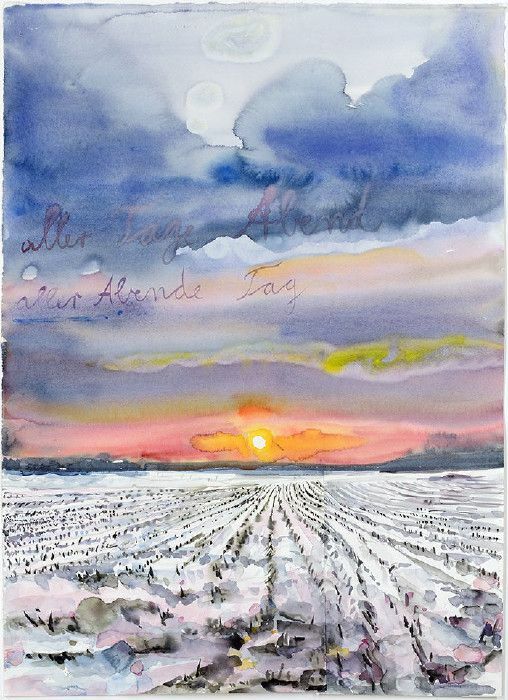 Anselm Kiefer, aller Tage Abend, aller Abende Tag (The Evening of All Days, the Day of All Evenings), 2014, watercolor on paper, 33 × 24 1/2 inches (83.6 × 62.3 cm) © Anselm Kiefer. Photo by Charles Duprat. What interests me is the transformation, not the monument. I don't construct ruins, but I feel ruins are moments when things show themselves. A ruin is not a catastrophe. It is the moment when things can start again. 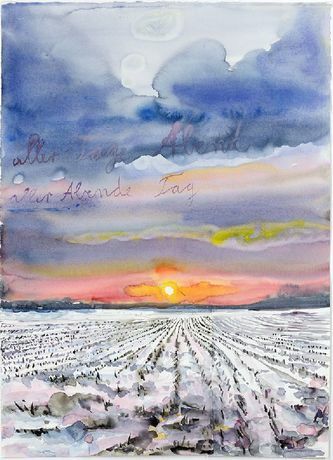 Gagosian is pleased to present new paintings, artists’s books, and watercolors by Anselm Kiefer. Employing broad-ranging and erudite literary sources, from the Old and New Testaments to the poetry of Paul Celan, Kiefer’s oeuvre makes palpable the movement and destruction of human life and, at the same time, the persistence of the delicate, lyrical, or divine. Central to the exhibition are more than forty unique artists’s books, their pages painted with gesso to mimic marble, displayed in an installation of glass vitrines. Erotically charged female nudes and faces emerge from the pages. Artists’s books are an integral part of Kiefer’s oeuvre; over time they have ranged in scale from the intimate to the monumental, and in materials, from lead to dried plant matter. In this selection of books, the sequences of narrative information and visual effect evoke the fragile endurance of the sacred and the spiritual through the female figures on the marbled pages. They are a reminder perhaps of the sculptures of Auguste Rodin, and even of Michelangelo’s belief that his figures were “freed” from the stone with which he worked. The large array of new watercolors in this exhibition marks a significant return in Kiefer's work to the elusive and sensuous medium. The exhibition’s title, “Transition from Cool to Warm,” refers to a celebrated book of watercolors that he produced from 1974 to 1977, in which cool, blue marine land and seascapes transform into warm female nudes. Kiefer's fascination for eidetic process, rather than teleological outcome is underscored by the alchemical effects he achieves in these new works—aleatory, and as luminescent as the natural forms they evoke. The watercolors and books are complemented by romantic landscape paintings, in which lakes can be glimpsed through screens of trees or where surfaces of splashed molten lead peel back to reveal the sea or landscape depicted beneath. “Transition from Cool to Warm” is accompanied by a fully illustrated publication with essays by Karl Ove Knausgaard and James Lawrence, and an interview with Kiefer by Louisa Buck. Anselm Kiefer was born in 1945 in Donaueschingen, Germany, and lives and works in France. His work is collected by museums worldwide. Recent institutional exhibitions include Louisiana Museum of Modern Art, Humlebæk, Denmark (2010); “Shevirat Hakelim,” Tel Aviv Museum of Art, Israel (2011); “Beyond Landscape,” Albright-Knox Art Gallery, Buffalo (2013); Royal Academy of Arts, London (2014); “L’Alchimie du livre,” Bibliothèque nationale de France, Paris (2015); Centre Georges Pompidou, Paris (2015). In 2009, he directed and designed the sets for Am Anfang (In the Beginning) at the Opéra national de Paris. “Kiefer Rodin” will be on view at the Musée Rodin, Paris until October 2017, subsequently traveling to the Barnes Foundation, Philadelphia. In November 2017, Kiefer will receive the J. Paul Getty medal for his contribution to the arts. For further information please contact the gallery at newyork@gagosian.com or at +1.212.741.1717. All images are subject to copyright. Gallery approval must be granted prior to reproduction. Please join the conversation with Gagosian on Twitter (@GagosianNY), Facebook (@GagosianGallery), Google+ (@+Gagosian), Instagram (@GagosianGallery), Tumblr (@GagosianGallery), and Artsy (@Gagosian-Gallery) via the hashtags #AnselmKiefer #CooltoWarm #GagosianW21St.